The AZT71 is a digitally programmed capacitor specifically designed to tune a crystal or SAW based oscillator to a desired center frequency. The desired capacitance value for production trimming is set by a serial data stream when placed into a programming mode. The AZT71 is designed to be a labor and cost saving device within the oscillator production process. 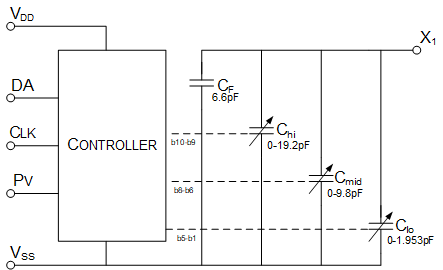 Using EEPROM technology, the capacitance can be re-tuned as needed during the production process by repeating the programming steps thereby increasing production yield.